I first discovered the joys of NUXE back in 2012 after I received a Space NK voucher for my birthday. After much deliberation, swatching and pondering, I decided on a large bottle of NUXE Huile Prodigieuse OR because it felt like a real treat - after all, a bottle of decadently shimmering, sparkly oil is not something I would usually spend my pennies on. Since then, I've tried skincare, cosmetics, fragrance and even a candle from the French brand and they remain a firm favourite. 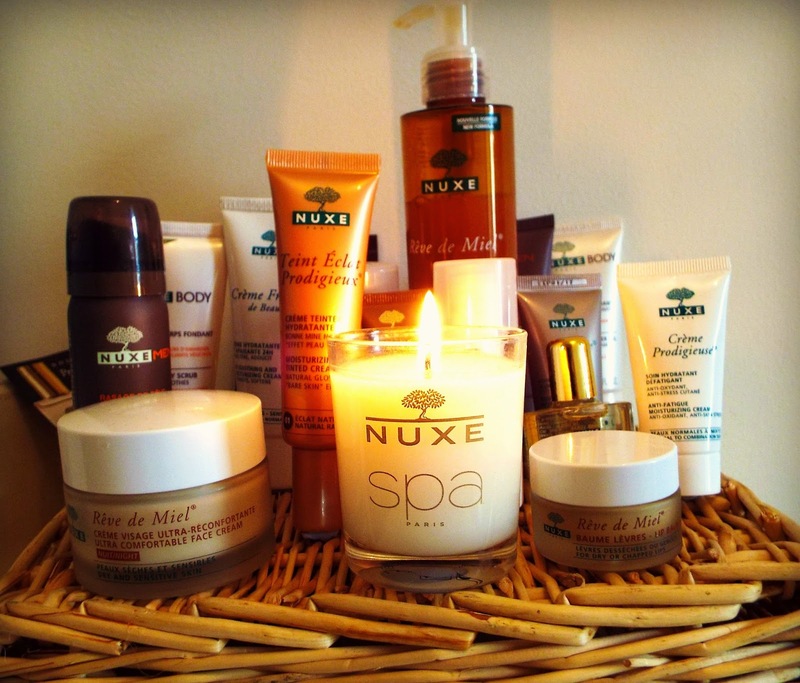 I check out the NUXE section every time I'm in a Space NK store but more often than not I order online from NUXE UK. NUXE UK is easy to navigate with detailed product descriptions, user reviews, tips and lists of active ingredients and what they do. I don't think I've ever logged on to the site without being met with a sweet deal of some kind. The most recent offer was/is a free Fondant Shower Gel with purchases over £30. They also have a neat little Summer Travel Kit that includes 5 miniature products for £13.50. You receive a free miniature and 3 samples with EVERY order! It's true! What's more, you choose the miniature you would like, which is a very nice touch indeed and a great way of trying more from their ranges. The Loyalty Programme works on a points system and you gain points every time you place an order. You earn 1 point for every pound spent and receive a £10 e-Coupon once you reach 100 points, a £25 pound coupon at 200 points and a £75 coupon at 500 points. Sure it may take a while to accumulate enough points but it's still a nice little incentive. As if you need one. Delivery is super quick (in my experience) and the products are so well packaged they could probably survive the reckoning. Some may say the packaging is a little too good (giant boxes with another box inside and those plastic pillow things) but at least you know your order will arrive in the best condition possible. Obviously the products themselves are fantastic and reasonably priced but today I wanted to post about the website rather than the products. If you've not tried anything from NUXE before, you can read my review of the Reve de Miel Ultra Comfortable Face Cream Night here.